As the holidays grow closers, business owners and internet marketers are trying to decide on the best way to spend their marketing dollars. It’s important to remember that internet marketing has multiple channels that marketers can use to get their message to their target audience. Despite claims from biased parties stating that one platform is better than the other, recent research from comScore suggests that marketers need to use both desktop and mobile marketing effectively to maximize their holiday sales. There’s a of reasons for retailers to be excited this holiday season. 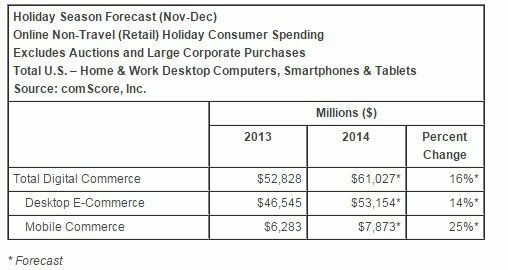 The official comScore 2014 holiday season forecast is that total online retail spending for the November–December period will reach $61 billion. This would be a 16 percent increase over last year. But neither mobile or desktop will steal the show. Marketing efforts on both marketing channels will see increases. “The 2014 online holiday shopping season is shaping up to be a bright one with more than $61 billion in spending expected, representing a year-over-year growth rate of 16 percent across desktop, smartphones and tablets,” said Gian Fulgoni, Executive Chairman Emeritus of comScore. Though mobile commerce is predicted to account for a little more than 10 percent of all ecommerce sales this year, accounting for $7.9 billion of retail spending. Similar to the growth in desktop spending, mobile ecommerce sales are growing at an annual rate of 25 percent faster than last season. By the end of the season mobile commerce is expected to represent 13 percent of total digital commerce. This research echoes the results of a Nielsen study on how important mobile will be to Black Friday sales this year. While mobile represents a smaller chunk of the pie for retailers in general, depending on the target demographic, mobile retail solutions become essential. Namely, millennials are far more likely to use their mobile devices to make purchases. Retailers who are targeting that demographic but not using mobile are putting their campaign at a disadvantage. A recent study from Loyalty360 gives another reason for small business owners to include mobile solutions in their marketing campaigns. According to their report, 56 percent of shoppers expect sales associates to use mobile technology on the sales floor, while 80 percent expect them to do so within 2 years. Having product information on a mobile site is convenient to customers and to sales associates who need to be able to answer questions quickly while on the sales floor. 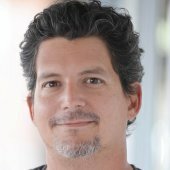 In summary, the comScore report shows that retailers should expect majority of their holiday retail sales to come from desktop computers. However, there will be far too many sales on mobile devices for business owners to neglect that channel. Also, as other research shows, mobile devices are good for shoppers who are webrooming. For more tips on preparing a site for the holidays, read this article with 7 stats that show why business owners should include gift card sales in their holiday marketing strategy.